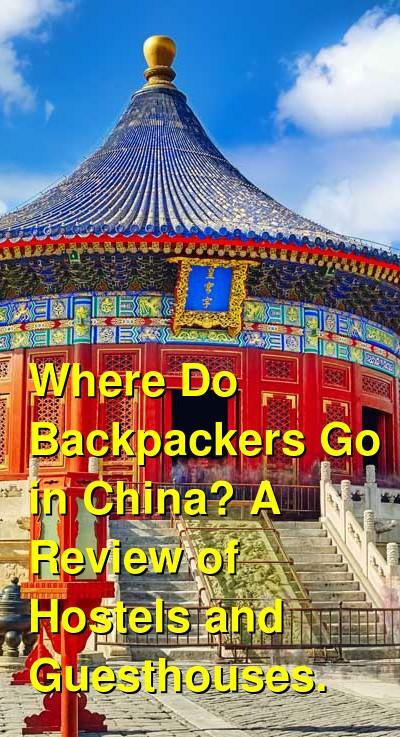 Where Do Backpackers Go in China? A Review of Hostels and Guesthouses. China continues to grow as a popular travel destination for backpackers and budget travelers. Although the prices may not be as low as nearby Southeast Asia, there are still many affordable places to visit. Hostels are available in most major tourist destinations, and budget guesthouses are also relatively easy to find. Many hostels have both dorms and private rooms that you can choose from, so if you're traveling with a companion but still want the social aspects and affordability of a hostel, then the private rooms may be your best options. Where Do Backpackers Stay in Beijing? The Houhai and Nanluoguxiang areas are popular with backpackers and budget travelers because they offer a unique glimpse into Beijing's past. There are many hostels, hotels, bars, and shops in the area, and many hostels have traditional Hutong courtyards. Nearby you'll also find Houhai Lake, the drum tower, and the Prince Gong Mansion. The Qianmen area is a popular tourist area with plenty of hostels, hotels, and guesthouses. 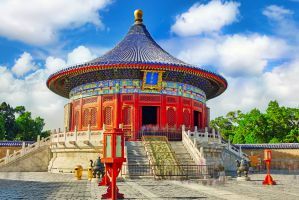 It is at the historic heart of Beijing and is a great place to base yourself if you want to explore the Forbidden City, Dazhalan, and Tiananmen Square. There is plenty to see and do in the area and there is no shortage of restaurants and shops. Wangfujing is a major shopping district in Beijing. It's also close to Tiananmen Square and the Forbidden City, so it makes a convenient base for exploring the main attractions. The area has many traditional shops and a famous snack street where you can try unique foods or cheap bites. Dongzhimen has become a major business area in Bejing, but it's also notable for its famous food street. If you want to stay in a more modern area, then Sanlitun is a popular option for foreign tourists. It has modern buildings and many western style restaurants, but it's also a bit expensive. Yonghegong is another unique hutong area where you can see historic neighborhoods but also enjoy trendy bars and restaurants. It's a great area to see how old world charm meets modern trends. Xidan is another convenient neighborhood near the Forbidden City. There are many international and high end shops nearby. The Xidan Cultural Square also hosts many cultural events throughout the year. Where Do Backpackers Stay in Shanghai? People's Square is a center of activity in Shanghai, and there are a handful of hostels to choose from in the area. There are plenty of tourists and locals wandering around with many great restaurants, shops, and nightclubs that keep the area active late into the night. The Bund is Shanghai's famous waterfront area. It has an atmosphere of colonial style luxury and there is no shortage of five star hotels and expensive restaurants around, but hidden among the luxury there are a few good hostels that offer cheaper accommodation for backpackers and budget travelers. The Bund is also a cultural area with many museums and art galleries. This area is popular with expats who enjoy the quiet streets, fun bars, and boutique shopping. Lujiazui is where you'll find most of Shanghai's futuristic buildings. This area is at the financial heart of the city and there are many high end hotels and fancy restaurants that you can enjoy. There are also malls and a riverside promenade that looks out on the historical buildings along the Bund. Shanghai's Old Town is one of the main tourist attractions in the city. It attracts lots of visitors every day, who come to wander the streets, visit the antique markets, and enjoy a delicious meal. Where Do Backpackers Stay in Xi'an? Most budget travelers and backpackers to Xi'an stay in the Bell Tower area. This is a central area inside the city walls and it is well connected by public transportation. There are a handful of affordable hostels in the area and plenty of good restaurants. The Drum Tower is to the west and the Muslim Quarter is north of the Drum Tower. The East Avenue Area used to be a commercial center for the city, but it has become less popular in recent years as the South and West Avenue areas have grown. The South Avenue Area is lined with high end malls. It meets the South Gate at its southern tip. The West Avenue area has been rebuilt with Tang Dynasty architecture making it one of the more beautiful streets in the area. The North Avenue is lined with offices and government buildings. Like many cities in China, there are a handful of cheap places to stay near the railway station at the northeast corner of the city wall. This area is convenient, but not really the nicest place to base yourself. If you want to stay outside of the city wall, then the southern area offers some interesting attractions including Big Goose Pagoda and Shaanxi Museum. Where Do Backpackers Stay in Guilin? The East Commercial Area in Guilin is close to the city center and connected by three bridges: Jiefang Bridge, Yshan Bridge, and Li River Bridge. There are a variety of tourist attractions in the area including Seven Star Park, Camel Hill, and Tunnel Hill Park, among others. The West Downtown Area is the traditional city center for Guilin. It's to the west of the Li River and there are many hostels and hotels as well as restaurants and shops in the area. There are a variety of sights in the area including Taohua River, Banyan Lake, Guihu Lake, and Mulong Lake, among others. The Li River area is a beautiful part of the city that has many hotels and restaurants for visitors. There are several scenic spots in the area and popular sights include Yu Hill Park, Diecai Park, Fubo Hill, and Elephant Hill Park. There are actually two railway stations in Guilin - The North Station and the South Station. The South Station is the main railway station, and it's next to the Guilin long distance bus station. There are some cheap hotels and guesthouses in this area that appeal to budget travelers and backpackers. Where Do Backpackers Stay in Chengdu? Tianfu Square is at the center of Chengdu and at one time it was the site of the Imperial Palace. These days, there's a water show every day in the evening at noon. Near the square there is a shopping mall and a transportation center. This is a convenient and interesting area to stay. Wuhou District is a popular area for tourists. It's most famous for the Wuhou Temple but it is also at the economic heart of the city. There are a variety of cheap hostels and guesthouse near the Chengdu South Railway Station.